Let Us Give New Life to Your Most Treasured Pieces! Le Vive Master Jewelers specializes in Jewelry Repairs, Jewelry Restoration, and Restyling. Below is just a few of the services we offer. When it comes to jewelry, there is no better place to go than Le Vive. All of our services are performed on site by our highly skilled Master Jeweler. We will give new life to your old and outdated jewelry pieces that are special to you. Ring Sizing - Is your ring spinning around? Or too tight? Let us size it for you! On-Site Ring Sizing larger or smaller, we don't send your jewelry out. We size Any White or Yellow Gold, Platinum, or Sterling Silver Ring! Polishing and Rhodium Plating* (*for white gold rings) is included for every sizing. We do not stretch rings, as this can compromise the integrity of the ring. When sizing any ring up; Gold, Platinum, or Silver is always added to the ring. Same and next day service available, call to set an appointment! Click Here for more information on Ring Sizing and cost! We Buy Gold, Diamonds, Watches & More! - Gold is at a near decade high, why not sell? Competitive Prices for your unwanted 10k, 14k, 18k, 22k, or 24k Gold and Platinum Jewelry! We pay per gram based on the gold value of the day. There is no confusing pennyweight or processing fees. Earn at least 10% more when using your Gold and Diamonds towards a purchase! We buy Diamonds of all shapes and sizes! And we buy Estate Jewelry Pieces. In most cases, we buy your jewelry as Jewelry; not as scrap-metal! Our Scales are Registered, and Tested by the County of Riverside! Rhodium Plating - If Gold is Yellow, where does White Gold come from? White gold is created when gold is alloyed with other white metals. While this does succeed in making gold more white, it can still be dull and will have a yellow tint. To achieve a pure white gold look, all white gold jewelry is Rhodium Plated. Rhodium is an expensive metal from the platinum family and is a true white metal, by rhodium plating a white gold ring it will make the ring shine a radiant white. Rhodium Plating is Performed On-site typically Same day or Next day. A full polishing is included with every Rhodium Plating service to make it shine! We can also turn any yellow gold jewelry into white with Rhodium Plating! Free Jewelry Cleaning & Inspection for any jewelry piece to help prevent loss or damage to your jewelry! We recommend that you have a complete Polishing and Cleaning at least once a year. Worn prongs are a common occurrence when you wear your jewelry day in and day out. Prongs require attention and repair typically every 3 - 5 years or when they get too low or damaged. Re-tipping prongs ensures that your Gemstones and Diamonds are safe and secure from loss or damage. Let your Diamonds and Gold jewelry shine like new with a thorough polish and cleaning! All Regular Maintenance is Performed On-Site! Jewelry Restoration - Was your jewelry damaged? Ran over by a car? We can restore your damaged or broken jewelry to its former glory! Family Heirlooms just not what it use to be? Let us give it a new life again. Complete attention to the details of the original design. Our on-site Jeweler & Design Team have extensive knowledge in refurbishing old and new jewelry! Bring back the brilliance of dull and worn Gemstones and Diamonds through lapidary polishing and re-cutting. Gemstone and Diamond Replacement for broken or cracked gemstones. Jewelry Restyling - Inherited jewelry that just is not your style? Restyling can be a great and cost effective way to create something new but still preserve the old sentimental value. By modifying your existing jewelry, you can create a new look that you will enjoy for years to come. Use the gemstones or Diamonds from an old ring so you can create a new necklace! Change an old ring into a new pair of earrings! Have you inherited a ring that doesn't fit your style? Let us redesign it! Are you tiered of your yellow gold jewelry? We can make it white! A great on-site selection of Loose Diamonds, in many shapes, sizes, and grades! Large variety of in-stock Loose colored Gemstones in traditional and unique shapes and cuts. Do you have any loose gemstones of your own? Let us find the right setting for them! Expert Diamond and Gemstone stetting performed on-site by our Master Jeweler. Vast selection of basic and unique jewelry settings in both White and Yellow Gold. Choose from existing in-stock mountings or we can help you create a complete custom made design! See more information about our custom designed jewelry here. Pearl Restringing - Is your strand looking old? Lacking the luster it once held? Multiple or Single strand restringing. Single or Double Hand Knotted between each pearl for the security of your pearl strand! 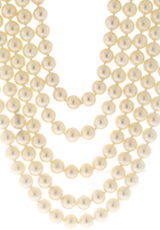 Large, Small, or Graduated Pearls; we can restring any strand! Converting a long pearl strand into a shorter style with a matching bracelet! Upgrade your clasp to increase the security. Soldering - Broken Chain? Want a Charm added to your bracelet? 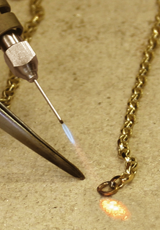 We can solder any broken chain, necklace or bracelet made of White Gold, Yellow Gold, Platinum, or Sterling Silver! Same day or next day service on any simple solder repair! Don't run the risk of losing your charms. We can securely solder each gold or silver charm on to your charm bracelet or jewelry. Replace a worn out clasp or o-ring. We Can also Repair most Fashion/Costume Jewelry! Bracelet or chain too short or long ? We can extend or shorten them.